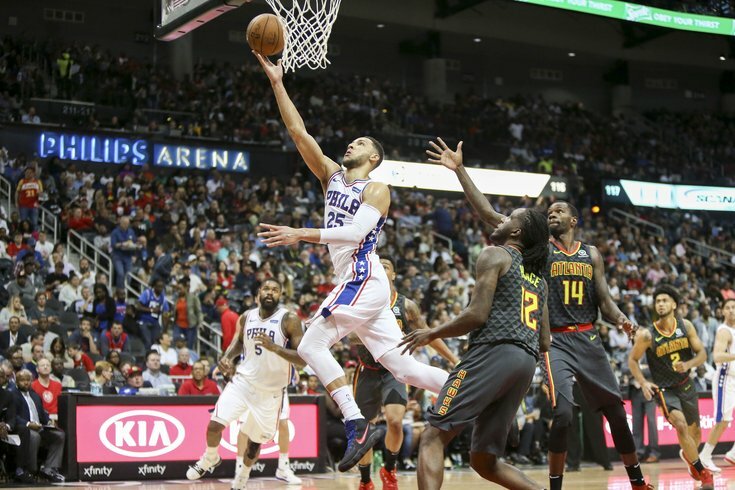 Philadelphia 76ers guard Ben Simmons shoots the ball against the Atlanta Hawks in the second quarter at Philips Arena. If not for a lot of shenanigans going on away from the court, a technical foul for Ben Simmons in the third quarter of Tuesday's game might have been a big storyline. Simmons, the picture of stoicism on the court, losing his temper over a call? Not something you see every day, nor do you see him in foul trouble all that often. But most of the basketball universe was focused on a storyline brewing in two different cities at once. Utah's Donovan Mitchell, Simmons' primary competition for the NBA Rookie of the Year award, used his pre-game swag to send a message about who he thought the winner should be, which sent fans and media alike into hysterics on Tuesday evening. Mitchell elaborated further in an interview with ESPN's Chris Haynes — who spoke with Simmons and generated the "controversial" comments that sparked this back-and-forth — made the same tired argument people with Jazz avatars on Twitter have been running with all season. I'll say this. I'll put it in perspective for people who obviously don't play in the NBA and don't know the life of the NBA. So let's say you have an exam to take on June 1 and you have a whole year to study for that exam, you're going to get a pretty good grade on it, aren't you? But some people may not have all that time to prepare for that exam. So, that's how I look at it and I hope that puts in perspective for people. I'm not sure how many tests Mitchell has taken in his life, but most tests do not award difficulty points or style points based on the amount of time you had to prepare for it. Either you answer things right or wrong, and you earn a pre-determined amount of points based on how your responses match the prompts. We can certainly argue about the difficulty of doing something with more vs. less prep time, but most professors only care about your end product. "If his argument is I'm not a rookie, if that's the only argument he has, I'm in pretty good shape then. There's a rule in the NBA for a reason. I'm not going to wear a sweatshirt tomorrow though," said Simmons. The NBA's final week is generally a total slog, with a lot of playoff teams just trying to get over the line without anybody getting hurt. You can see why with a glance around the league — Dario Saric was knocked out of the game with a tooth/lip issue in the first quarter at Atlanta, and Luc Richard Mbah a Moute, a critical defensive piece in Houston, separated his shoulder against the Lakers. So the "beef" between Simmons and Mitchell added a little extra juice to this dead period of basketball, and even if the whole exercise is a bit silly, it's ultimately part of what makes following the NBA so fun. There's nothing wrong with a healthy dose of competitive fire, and that goes for both guys. If we had to choose a group of players most responsible for Philadelphia's wins this season the list would start with Joel Embiid and Simmons, feature healthy doses of Dario Saric, Robert Covington, and JJ Redick, and offer marginal credit to a bench player or two on a given night. The stars and youth have done most of the heavy lifting this season. You might have expected that to be the case in the waning moments of the regular season, with the veterans trying to save some mileage on their bodies before the real festivities get going. But with most of that young group hurt or in foul trouble on Tuesday, it was up to the vets to get the Sixers over the line. Boy, did they ever come up huge in a game that was much closer than it needed to be. Between Redick, Amir Johnson, Ersan Ilyasova, and Marco Belinelli, the Sixers got a combined 89 points at a time when they desperately needed them. Each player's contributions on the offensive end added something different, reflecting the various styles they bring to the table. Johnson did his usual ugly but effective thing, using some running hooks and offensive rebounds to put himself in position to score. Redick was used all over the court, spotting up from mid-range and nailing threes in transition. But the scoreboard doesn't discriminate based on how pretty or smart-looking a shot is, and it only matters if it goes in. Belinelli's third-quarter effort — he had nine points on 3/5 shooting from downtown in the quarter — helped stabilize the team once Simmons hit the bench with foul trouble. Ilyasova found his points all over the place, getting to the free-throw line, snagging loose balls, hitting threes, and generally just being in the right place at the right time. He had a particularly tough role on Tuesday night, thrust into what was effectively a starting role out of nowhere following Saric's early exit. In a nutshell, that has been the biggest difference for this Sixers team during their recent upswing, aside from improvement of the young players. When the stars hit the bench or don't have it on a given night, there are just more reliable contributors for Brett Brown to turn to. Early in the year, guys like Jerryd Bayless and Timothe Luwawu-Cabarrot would just compound problems instead of solving them, and Bryan Colangelo's pickups shouldn't be undervalued in that regard. If the Sixers can get both their stars and bench going at the same time in the playoffs, look out. What, exactly, is Markelle Fultz going to offer in the playoffs? Fultz can best be described as a mixed bag so far during his return, which is about what you'd expect from a 19-year-old guard coming off a 60+ game layoff. What's strange about the whole thing, however, is that the areas he has struggled in are not really something the public was prepared for when he was taken out of the University of Washington. He was expected to be a natural scorer and floor spacer, and has had a difficult time finding his way on that front. That was the case against Atlanta once again, with Fultz shooting 2/6 from the field and often finding himself with nowhere to go once he hit traffic. When he has been able to pull off some of his go-to moves, Fultz's flashes have been brilliant. But there is an obvious instinctual problem for Fultz right now, who is making life more difficult for himself by discarding the possibility of taking three-point shots. Fultz is not just passing up threes, he's vacating spots on the perimeter before there's even an opportunity to make defenders believe he'll shoot. If teams know you're going to barrel into the paint, they'll wall it off and force you into difficult attempts. In the recovery he made to make up for that play, you once again see a flash of how Fultz can help your ballclub. He competes hard to get back in the play after getting snuffed and forces Atlanta to reset and play halfcourt offense. And though his instinct to leave the line can't continue long-term, it should not be presented as something that only produces bad things. Teams are collapsing bodies into the paint on every drive, and though that hurts his own shooting percentage, he is making good reads as a passer and kickstarting chain reactions that lead to good shots for his teammates. At this point, it seems a lot more likely Fultz is going to add value as a playmaker in the playoffs than it would be for him to be their scoring spark. Using him as the backup to Simmons has allowed Brown to put shooters around Fultz, which has minimized the impact of his lack of shooting and created space for him to weave through with his handle. The shooting and finishing are clearly not there yet, but with an assist-to-turnover ratio at nearly 3:1, turning the second unit over to him does not seem like a stretch. For now, he brings a set of strengths and accompanying problems that this team is equipped to handle. Given T.J. McConnell's ineffectiveness over the last couple months, at this point, it should be Fultz's job to lose outside of some situational defensive opportunities. For those of us who watched Fultz in college, however, it's a very perplexing situation. Left is right, up is down, and the scorer who most people would expect to have playmaking difficulties as a rookie ballhandler is passing with gusto while struggling to get buckets. Their win over Atlanta was nothing to write home about, but it was absolutely critical to keeping Philadelphia in the hunt for the No. 3 seed in the East. The franchise's playoff fate is in their hands heading into game 82 and combined with the 15-game streak it's something even their coach was a bit taken aback by following the game. "Taking that type of momentum into the playoffs is important. It doesn't guarantee you anything, but it certainly lets you feel like you've been doing the right things, the team has been fantastic," said Brown. "We got one more game that we understand the opportunity that we have, going back tomorrow to play at home against the Milwaukee Bucks ... we have to continue to fight for stuff and make stuff happen." We've been over this a ton in recent weeks, but Philadelphia grabbing that No. 3 seed is critical if they want to make real noise in the playoffs, or even make a surprise run to the Finals. Locking into that position would put them on the opposite side of the bracket from Toronto and Cleveland, guaranteeing at least one would be eliminated by the time the Eastern Conference Finals came around. The Sixers would still have a tough route no matter who they played, but playing a beat-up Celtics team or the Miami Heat is certainly different from dealing with LeBron James or the best team in the conference. Should Philadelphia win, they don't need any help from other teams to make the No. 3 seed a reality. Nothing underscores what a dream season it has been for this young bunch like that fact — they have a perfectly reasonable belief that they can lock in 52 wins, the third seed in the conference, and an ideal playoff route just by taking care of business. With Wednesday's game against the Bucks serving as a potential playoff preview, the Wells Fargo Center should be loud and proud tonight. A lot of people have waited a long time and watched a lot of losses to get to this point, and I'd recommend making sure you enjoy the moment before the pressure and stress of the playoffs emerge this weekend.